Cacti - which are only fond in American deserts - are a type of succulent plant because they store large amounts of water in their thick, fleshy stems when it rains. They have spines instead of leaves because spines allow less moisture to escape. The tallest are saguaros which can reach 15m tall and live for 200 years. Some desert plants only grow when it rains. Their seeds may lie dormant, or inactive, in the ground for years, just waiting. When rain comes, they: grow, flower and die within a few days. The century plant, for example, produces just one flower in its lifetime. Trees such as the acacia have leaves pointing upright to protect them from the intense sunlight and have developed a resistance to fire. Many desert plants have long, shallow roots which spread out over a wide area. The roots absorb any rain which soaks into the ground. Their leaves are always very small, to minimise water evaporation from their surfaces. 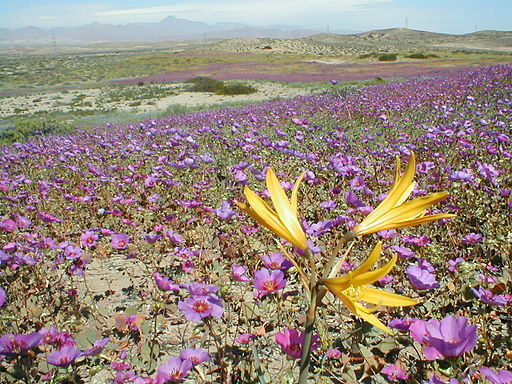 When it does rain, deserts are often scattered with bright flowers.